Menstruation is the blood flow in the specific period in a month. It occurs because of the shedding of the uterine lining (endometrium). It occurs on regular intervals in reproductive-age of human females and some of the other mammal species. Start at the onset of puberty and end at the beginning of menopause. Severe uterine pain, also known as Dysmenorrhea is common for young women. Discomfort and swelling in breasts also caused by premenstrual water retention. The symptoms and sensations vary for each individual also vary between each cycles. Weepiness (i.e. tears of emotional closeness). Later the level will be increased and then slowly taper. Hormonal disturbances may influence heavy discharge. No clear interval pattern for prolonged flow. 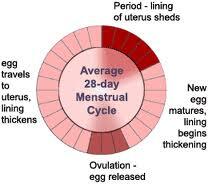 Every woman's cycle is or should be 28 days long. The above statements are myths. Every woman is different. The nature of body is highly different for each woman. It may different between fat and lean women. The food they eat, the life style they follow, the medicines they used to for other health problems also has their own role in controlling the menstrual cycle. Some woman has a belief that by consuming foods items like jaggory, dates may influence for the early heavy flow. The contraceptive pills may disturb the menstrual cycle. After a child birth the woman won’t get menstrual cycle during the lactation period. This is the natural contraception and this also highly varies between each individual. The lactation period is different for different females. The beginning of menstrual flow after the child birth may be early or slow depending on the nature of that particular woman. Want to know more about “Menstrual Cycle”? Click here to schedule live homework help from a certified tutor!